Next time you&apos;re at Dulles Town Center in Sterling, I highly recommend you take a spin on its historic carousel. Its not hidden, right at the Food Court and visible from outside above the entrance opposite Cheesecake Factory. Built in Venice, Italy, the carousel is in the style of the carousels of the 1800s with murals hand-painted by Venetian artists. The molds of the horses and other features are from the original Philip Schneider German Carousel constructed in 1898. Carousels were modeled after roundabouts originally pulled by real horses. This Carousel was shipped from Venice in hundreds of pieces and rebuilt here for your pleasure. The Carousel is illuminated by 570 lights. Features include 17 horses that move up and down, 4 rocking horses, one dolphin chariot that sways back and forth, and 1 teacup spinner that turns in circles (and I can assue you its more like a milkshake maker, or at least you end up feeling like a milkshake). The Carousel also includes a black horse, which is included for good luck, and dates back 2,000 years to the Roman chariot race tradition. One great detail is that the horses tails are real. 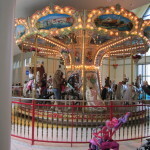 It is said that it is called a Carousel because it revolves counterclockwise, whereas a Merry-Go-Round turns clockwise. Rides are $1.50 and the great thing is parents are free if they&apos;re riding with a paid child. Its a great diversion in wintertime too if you&apos;ve got kids that have been pent up too long. So next time you&apos;re doing a little shopping, why not hop on for a spin. I can attest that no one getting off at the end of the ride is frowning.